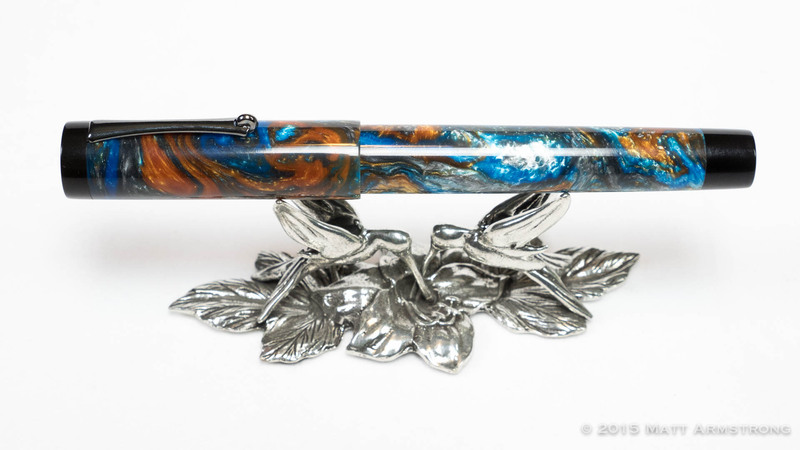 I first stumbled into the world of custom pens when a pen-friend of mine, Rob, lent me a custom pen he had ordered from Scriptorium Pens. 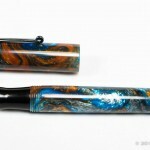 I reviewed it and liked it so much I ordered a custom pen of my own before I had even returned Rob’s pen. 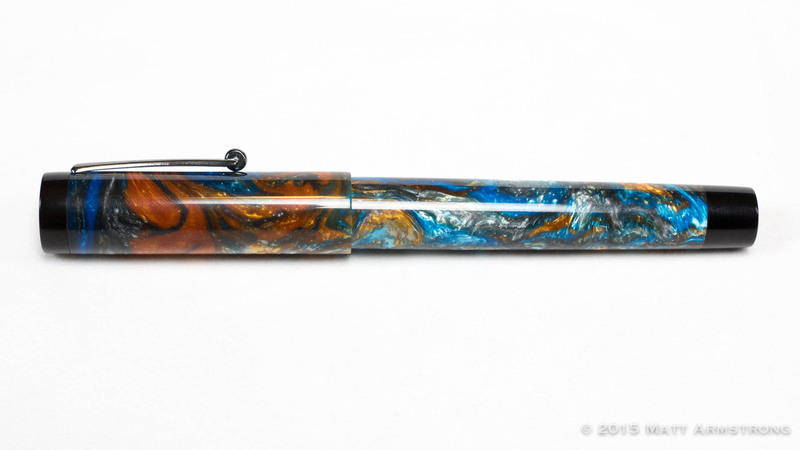 As much as I love acquiring production pens from the major manufacturers (and I do), there is something especially exciting about having a pen made to your own tastes and preferences. 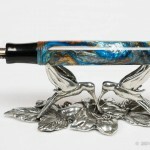 It allows you to tweak a pen to get exactly what you want. 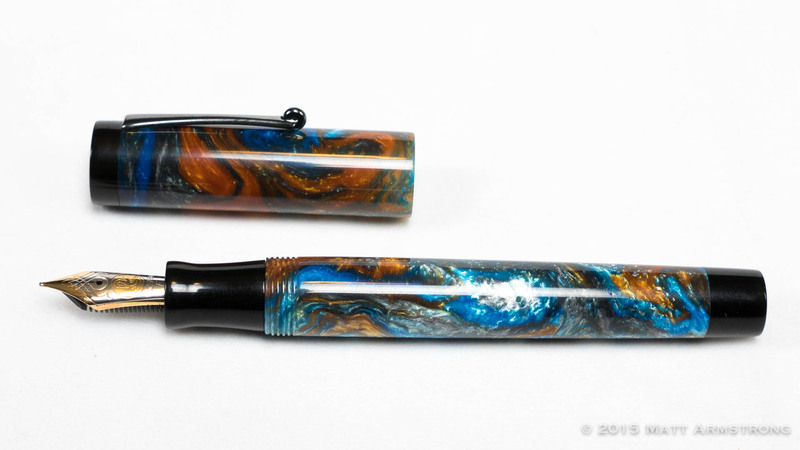 And I had a pretty specific design in mind for my first pen. 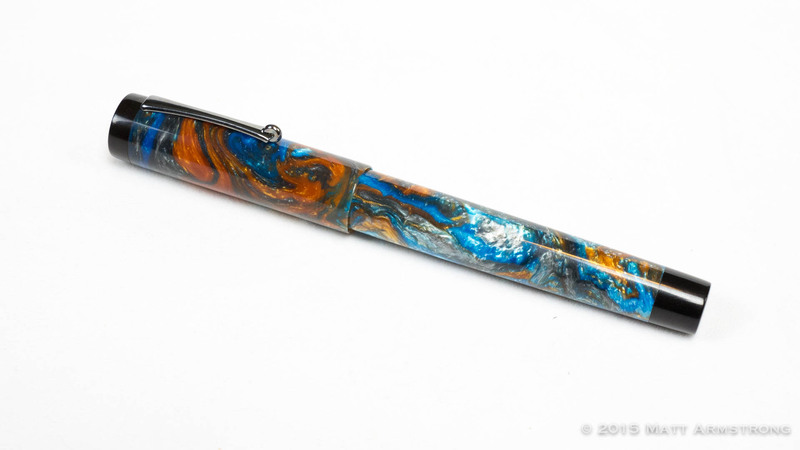 This pen was my first custom-ordered pen. I wanted to start with one of Renee’s stock models, the Chronicler. 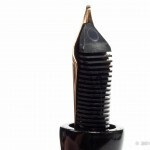 The Chronicler is a flat-topped model that takes its design queues from vintage pens like the Parker Duofold. 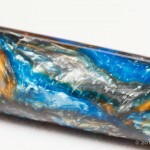 I also knew I wanted the main body of my pen to be made from the luscious Lava Explosion #3 (Mineral Seas) Alumilite. 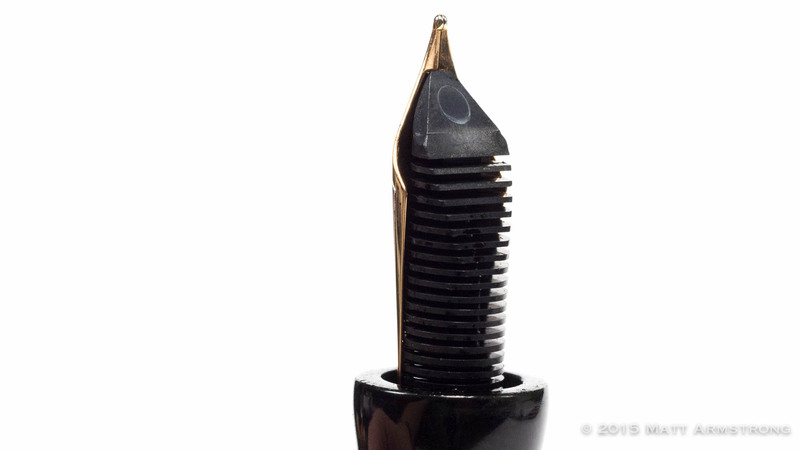 And I knew I wanted to use a spare Pelikan M800 nib I had floating around in my pen toolbox. 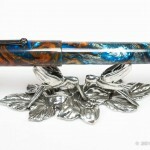 With those requirements in hand, I reached out to Scriptorium Pens and placed an order. As part of the customization process, I asked about the possibility of making a few tweaks to the stock design. First, I wanted to use a different color material for the cap and barrel finials and for the section. (I am irrationally bothered by highly patterned acrylic where the pattern doesn’t line up where the pieces join, which I knew was likely with this matter.) I settled on black ebonite since I like the feel of ebonite in the hand for a grip section. 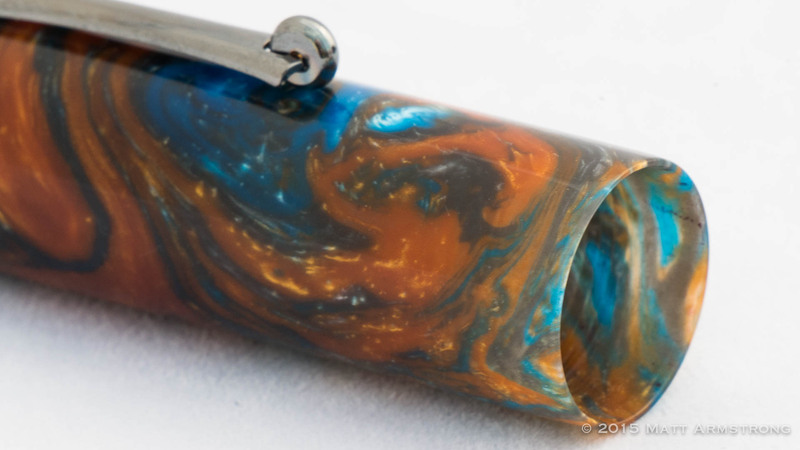 I also asked about shrinking the size of the finials a bit in order to maximize the amount of the gorgeous Alumilite material that would make up the barrel. 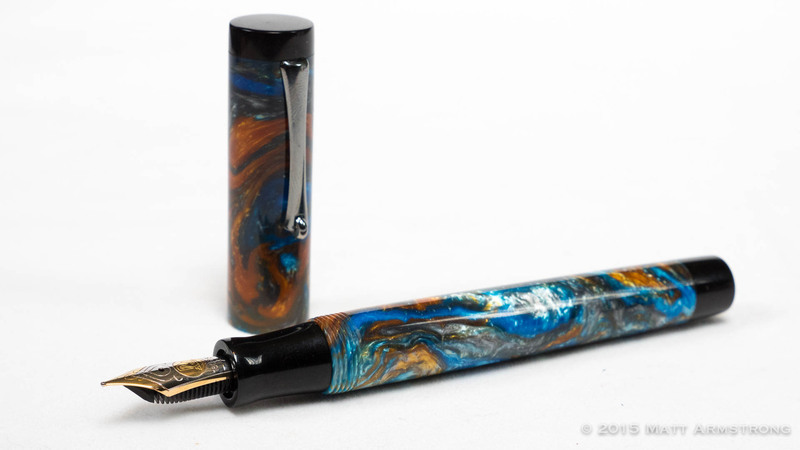 What came back was a pen that met all of my goals for this model: a beautifully made pen from great materials that fits comfortably in the hand and writes like a champ. The cap of the Chronicler is perfectly cylindrical in shape with a streamlined, Ruthenium-plated clip which has a small roller. I love the vintage look of this clip, but it feels a bit undersized for the size of the cap. The clip is extremely stiff and securely installed. 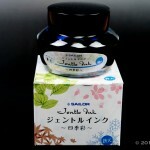 The cap comes to a very thin cap lip, which feels a touch on the delicate side. 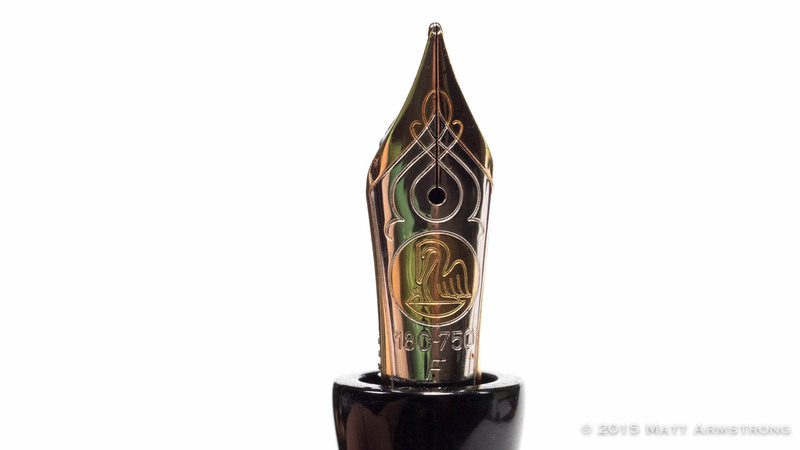 The pen’s barrel is also straight-sided, with a slight taper toward the bottom finial. The Chronicler comes in several sizes, and this large-sized barrel is quite large. 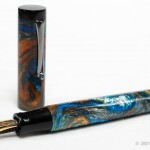 When used as an eyedropper, it can hold a torrential amount of ink. 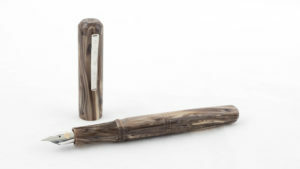 The pen’s section has a lovely, curved, concave shape which is quite comfortable in the hand. In construction quality, the Chronicler is exceptionally well-built. 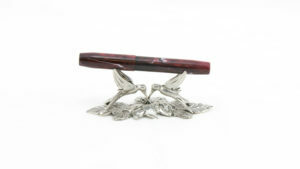 The shape is excellent, The pen is beautifully sanded and polished, and the joins between the materials are rock solid. 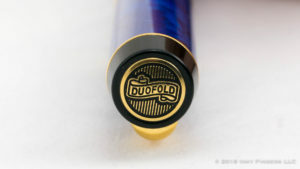 The threads between the section and the barrel are tight and smooth. The only aspect of the construction that isn’t utter perfection for me is the threads between the cap and the barrel. They tend to feel a bit slack, and don’t mesh as smoothly as I might have expected. I’ve never had any issues with the threads getting crossed or with the pen’s cap coming loose—they just don’t feel completely smooth. In the hand, the Chronicler is extremely comfortable. 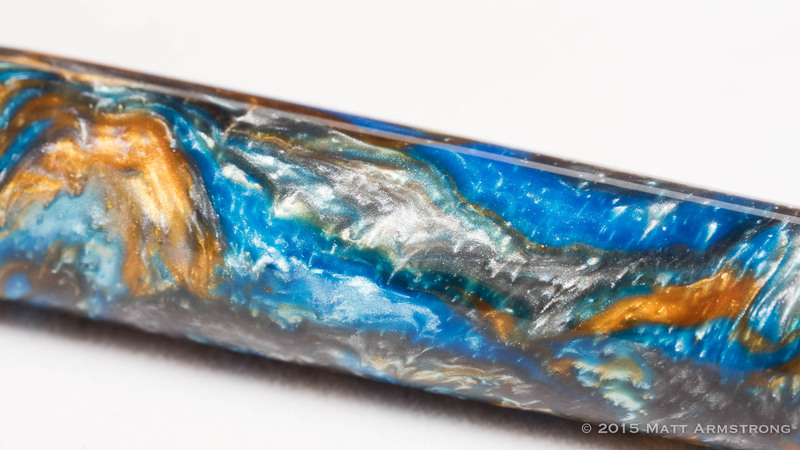 Alumilite is not a heavy material, nor is ebonite, so the feel in the hand is on the lighter side even despite the pen’s larger dimensions. The shape of the section is wonderful. 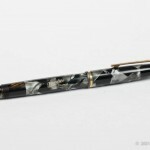 There is only a minor step-down between the barrel and the section and has no impact of the feel of the pen in my hand. This pen’s design doesn’t allow for posting. 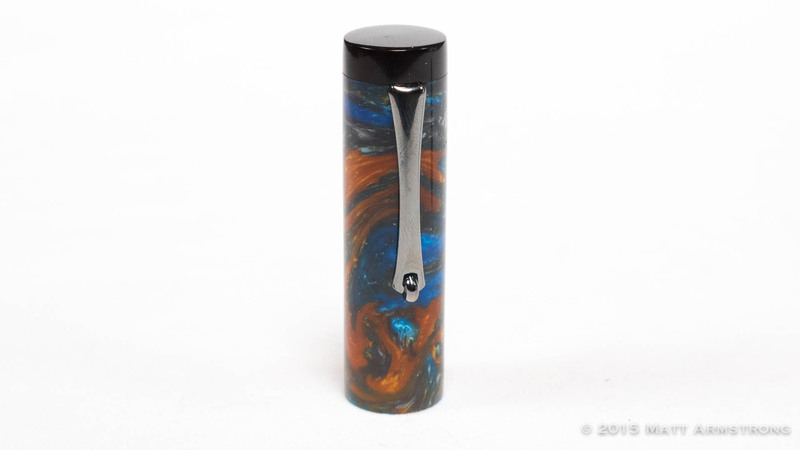 The opening in the cap will slip over the end of the barrel, but it doesn’t stay put once there. The inability to cap the pen doesn’t bother me, though, as the pen is long enough that posting is completely unnecessary. 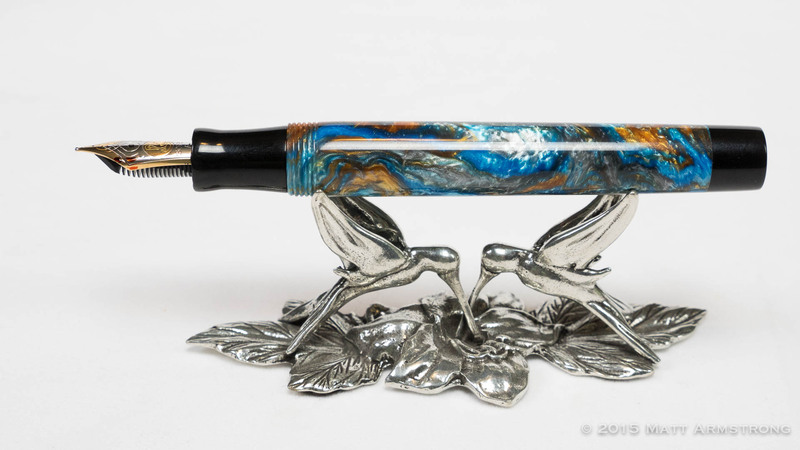 The Scriptorium Chronicler is a great writer, but I won’t spend too much time on a review since the pen was fitted with one of my own nibs which I adjusted to my own preferences even before sending it to Renee for inclusion in the pen. 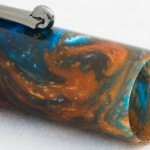 Custom pens are a lot of fun. 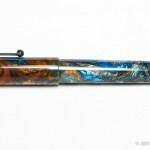 You get to buy a pen that matches the materials, colors, shapes, and writing style that you’d desire. That customization, however, does come at a bit of a cost. (But perhaps not as much as you might think.) 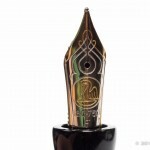 Renee’s pens start at $225, which puts them just slightly above the $150 price range for production pens you might get from Edison, Franklin-Christoph, Lamy, Platinum, Pelikan, Sailor, or Pilot. 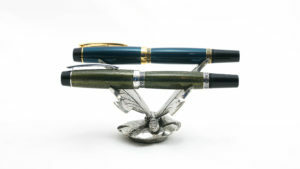 Special materials, multiple materials, gold nibs, or extreme customizations can add some extra to the price. 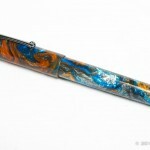 I think that is an exceptionally reasonable price for such a well-made, handmade, custom-made pen.